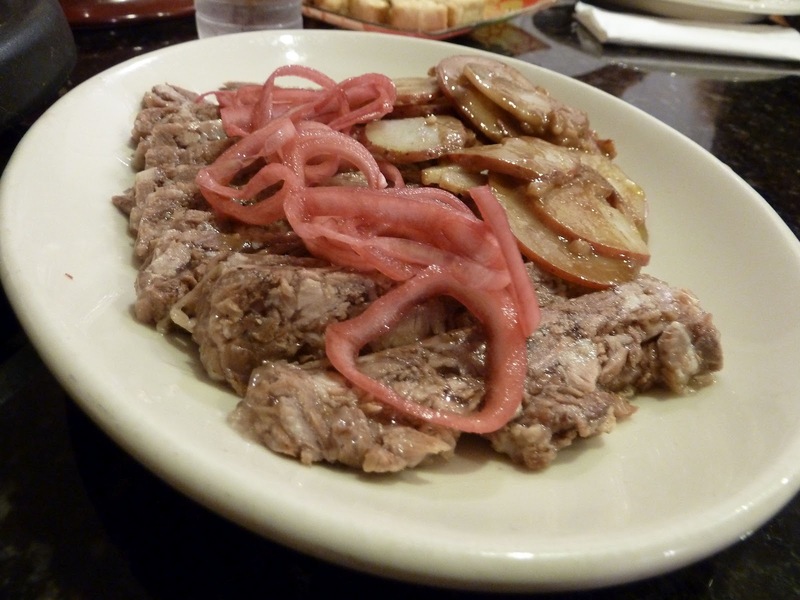 Warning: This post comes with recognizable pig parts. If you knew the pig we're dealing with here, it might end up being somewhat upsetting. Or, if you have an unnatural attraction to the movie Babe, this might not be the post for you. There will be some photos in here that will make it exceedingly clear that it's a pig we're dealing with. Even moreso than when I wrote about the foot. OK, did that clear everyone who's not interested? 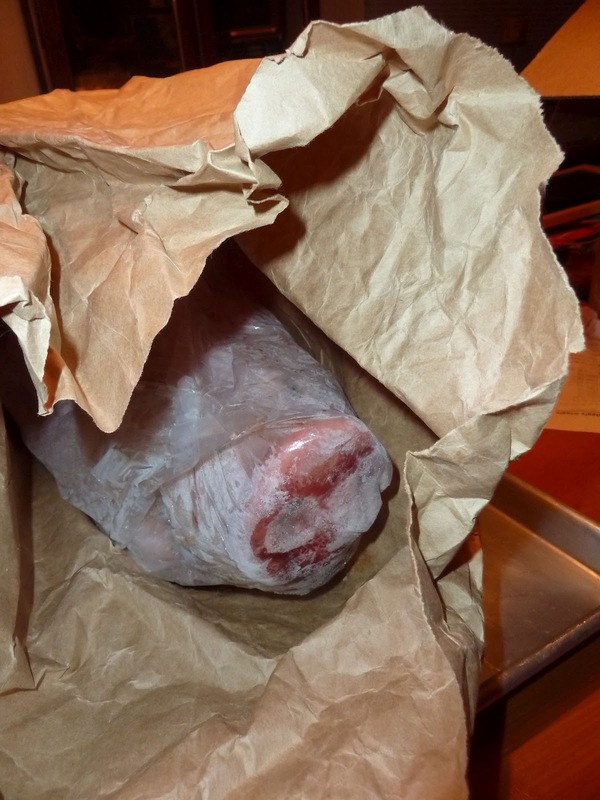 There was a little bit of irony involved when I went to Nature Delivered in Brooksville, Fla., to buy a half a pig. One of the reasons I went to a farm was because I knew I was going to need a pig head to do this recipe. They hardly ever have those at Whole Foods. But the process by which my pig was dispatched meant that I couldn't have the head of that pig. At the time, the farm did field kills for people buying pigs for personal use, or USDA plant kills for commercial. I was told the plant kills were more stressful on the animal because they don't want to travel. And if we did the plant kill, I couldn't witness, which was part of why I was doing it. I wanted to better understand my place in the food chain by watching the consequences of it. But the field kill process they had there at the time leaves the head with a certain degree of, um, lead poisoning. Tends to leave it a bit inedible. 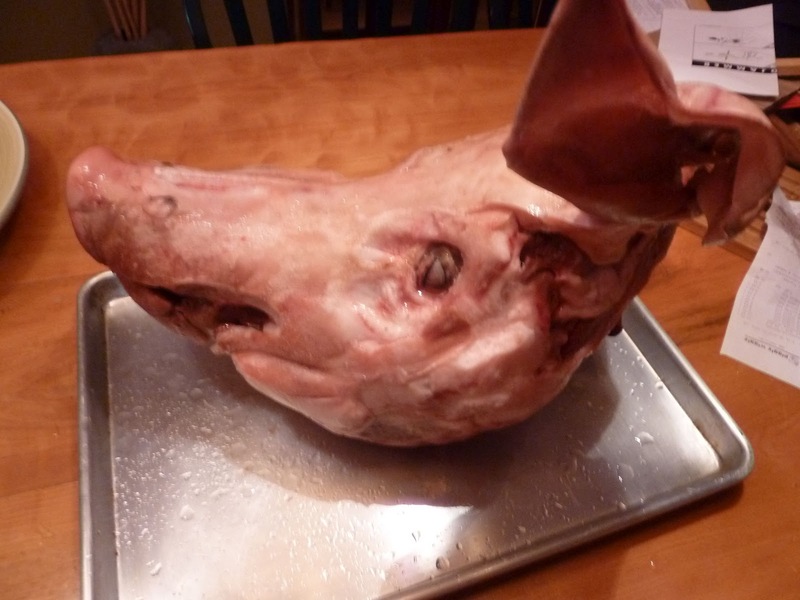 But Rebecca Krassnoski, who raised my pig, told me she would save the next noggin from a USDA processed pig for me. That wasn't the last issue. 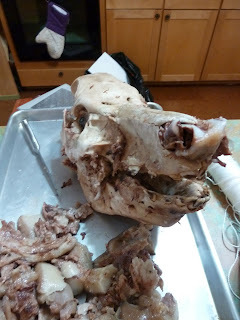 The recipe for Warm Testa with Potatoes in the Babbo cookbook technically calls for a half of a pig's head. "You can't really have half of one," Rebecca said, struggling to figure out how to explain what was really pretty obvious. "It doesn't really work that way." So I was going to get a whole pig's head. I would have to figure out how to deal with that. I figured I had two options: I could double the recipe. Or, I could look in some of my other cookbooks and see if I could find another recipe that called for a half a pig's head. You laugh. I have several. Rebecca, if you remember this pig's name, please do not tell anyone. Alas, it was in there for about three hours. I started making this at about 10 p.m. that night. The chivalrous explanation for that is that I didn't want to subject Pam to the carnage. And it worked out that way, so that's the official story. But the truth is, this happened just a few days before I moved to D.C., and that was literally the only time I could do this. It was a busy couple of weeks. Well, it was a busy several months, but those couple of weeks were insane. Some of the stuff I had in the freezer made the trip up with me. But here's the thing. This head weighed 25 pounds, and took up a lot of room in our auxiliary freezer in Florida. In D.C., we don't have an auxiliary freezer. We barely have the one. So I was up until 4 in the morning doing this dish because I had to, or it was never going to happen. OK, so the pig visage sat in the cauldron for three hours. Done, right? Ha! At that point, after letting it cool, now somewhere on the order of 2 a.m., it was time to start pulling the meat off the face. It harkened back to Biology II in Mr. Mabie's class as I extracted muscle after muscle after muscle. Neither recipe specifically called for the brain, so I didn't have to cut the skull in half, which was good because by that point I had already given away all my saws. Well, I still had a Dremel, and you can do anything with one of those, but I didn't think of it at the time. I did yank the tongue out, though. From the neck end. It was late. It wasn't pretty work. I'm sure if you've done it before, you're calling me names and exclaiming how it's no big deal. But for me, it was a lot of yanking and pulling at greasy, cartilage-y, collagen-y gunk. Chang goes into way more detail on how to do this than Mario does, which was helpful. He explained that you want to avoid the glands, and that there is "good fat" that you want to keep, implying that there is bad that you don't. When I write a horror movie screenplay, there will be a scene inspired by this experience. 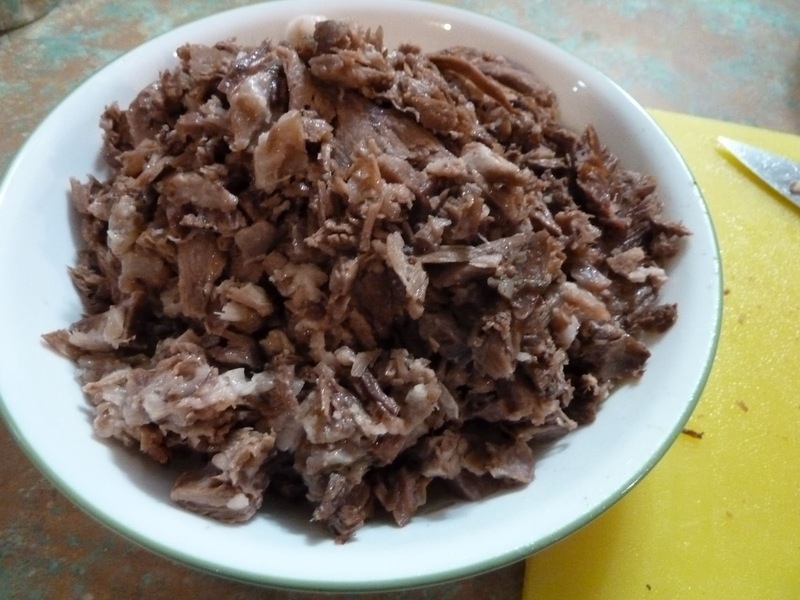 A 25-pound pig head, reduced to 2 pounds of meat. Well, mostly meat. Oh, there was also the skull, of course. For the Babbo dish, the meat gets put in a small loaf pan with some of the cooking liquid, which is so full of gelatin by now that it could support the weight of a small island nation. Then it gets refrigerated until it sets up. 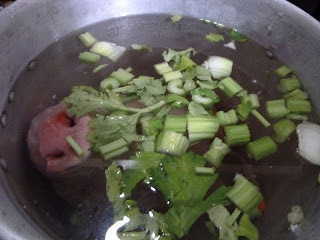 At which point we have head cheese! 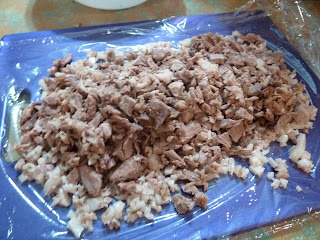 Then it's rolled tight in the plastic wrap and refrigerated to let its gelatin do its thing. Then I went to bed. It was after 4 at that point. The next day, the log is cut into discs, breaded and fried. Chang has a recipe for spicy mustard and pickled cherries to go with the torchon, which I'm sure is delicious and all, but I was trying to empty my kitchen, not add to it. I had some Dijon and some cherry preserves. 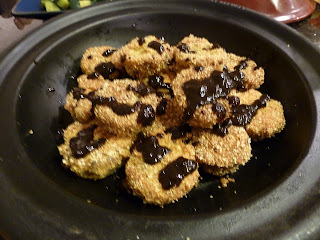 I mixed them up to make a cherry-mustard sauce to go with the pork. It worked out. The Babbo head cheese gets served with a quick potato salad and pickled onions. I took both dishes over to my pal Laura's house. I had strong questions about how much I would like either dish, so of course, the first thing I did was take it to a food critic. Both dishes were fine. I didn't love either. It was a texture thing. A lot of meaty bits suspended in goo. It's a thing, I know, I just couldn't love it. 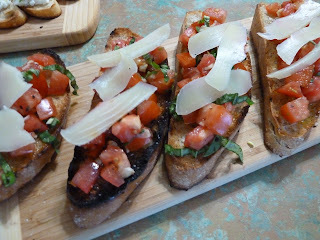 I gave the bulk of the Babbo dish to my friend Alan. I felt confident if anyone I knew would be into it, it was him. He said he liked it. So I was glad that the effort was appreciated. The ultimate measure of how much I like something is usually: Would I make it again. And the answer is, to almost a certainty, no. Mostly because I gave away that 32-quart turkey frying pot. I nearly missed the window on this dish. I thought I had done all the fava-related dishes last spring, but as I was flipping through, I saw this and realized I had missed one. So I planned to make this dish when I started seeing favas in the farmers markets a few months ago. Then there was a recipe I was supposed to test for work that called for fresh favas, so I figured if i could find them, I'd knock this dish out with that one. 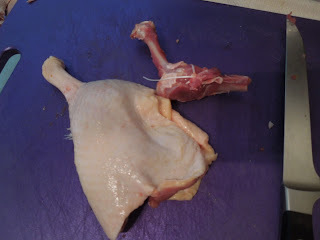 I had already picked up the duck legs from a farmers market, and had them sitting in the freezer. So, what we have here is a lesson in shopping out of season. After looking around long enough, I found favas at an Asian market in Virginia. I bought four pounds, which, after shelling and peeling, netted me 2 cups (the process and travails of which can be read here). Most of the beans were bigger than I would want them to be, and a lot of the pods seemed a bit woody. The dish calls for the favas to basically be raw, cooked only long enough to get the individual beans peeled. So I was a little nervous. 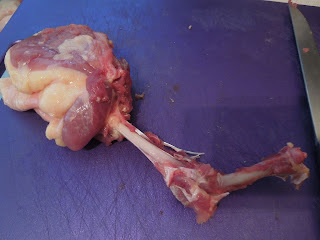 The meat pulled back from the thigh bone. The meat pulled most of the way off the drumstick. The boneless meat beside the meatless bone. Ta-da. For the other three legs, I took no photos, and had them all done in about 10 minutes altogether. So there's a lesson about taking pictures while you're deboning fatty animal parts. 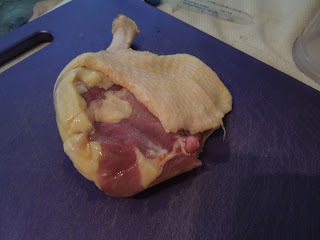 (Also, there's way more meat in a duck leg than a pig foot, but that's another story. The flimsy duck leg gets stuffed with bread crumbs spiked with citrus zest, herbs and olive oil. Then tied to maintain their shape, and roasted. Tied to maintain their shape. "Eh, I'll just roll them up and put the seam side down. It'll be fine," I thought to myself. As the legs were roasting, I could see they were not maintaining their shape (maybe they needed to be tied? ), the meat and skin contracting so that what once looked like a duck leg now sort of looked like a baseball with a little nubbin on the end. The other thing I noticed was that the legs had given off so much fat in the roasting process that they were nearly submerged in a jacuzzi of their own bubbling oil. They weren't roasting, so much as they were frying in duck fat. They weren't roasting, so much as they were frying! In duck fat! So in the end, my dish looked almost nothing like the photo in the book. And I don't care, because it was delicious. The duck skin was as crispy as I've ever made duck skin. 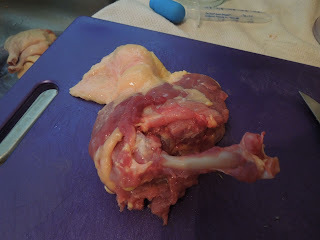 And the stuffing, which was now sort of a crust after the leg basically turned itself inside out in the cooking process, possibly because it hadn't been tied to maintain its shape, was crunchy and citrusy. 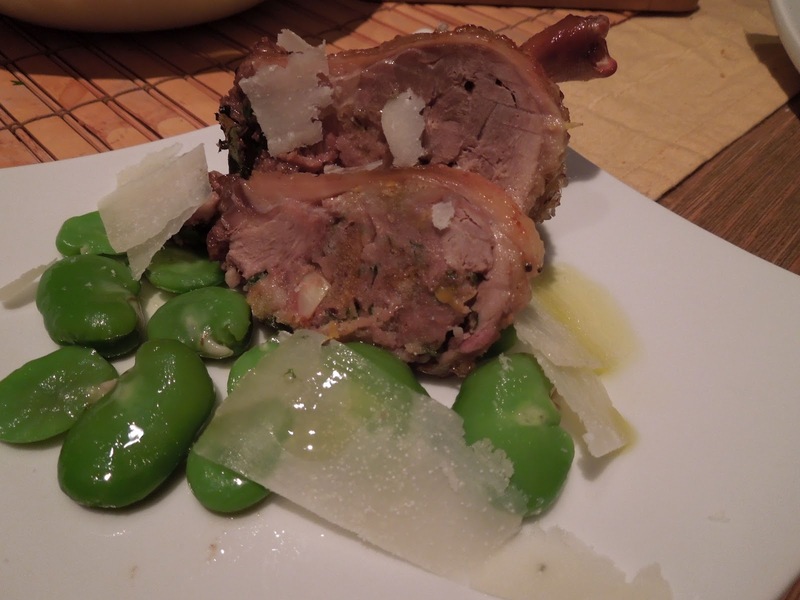 The favas, as I suspected, were not very good, through no fault of the recipe. But that was a minor point next to the success of the duck. Up next: Cover your eyes, it might be time for the warm testa. Sometimes, there is no drama. Sometimes, I just go to the store, and everything i need is just there. Sometimes, there is no process that I've never dealt with before. This one was easy. Pretty much everything I need for this dish is available at any supermarket. 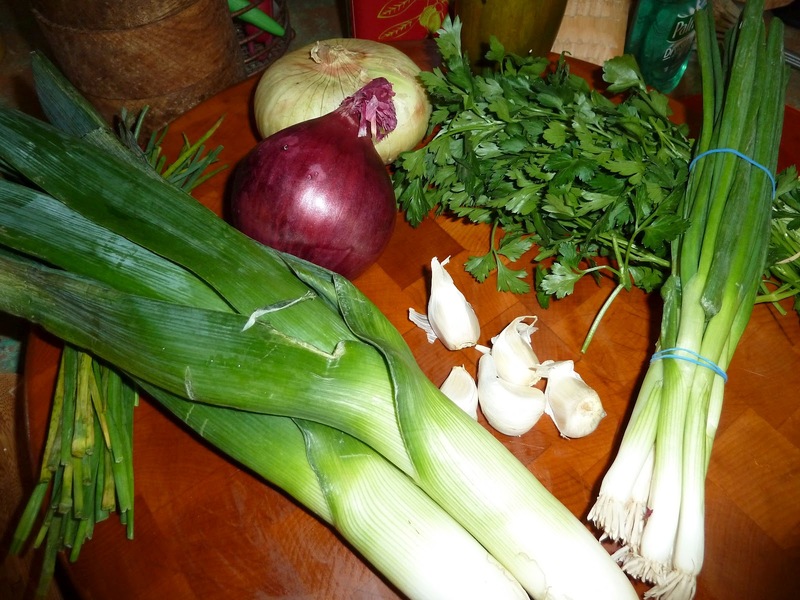 The five lilies refer to all the onions in the dish. There are Vidalia, red, leek, scallion, garlic and chives. Wait … that's six. Pretty sure they are all alliums, so I'm not sure which one isn't getting credit in the title. 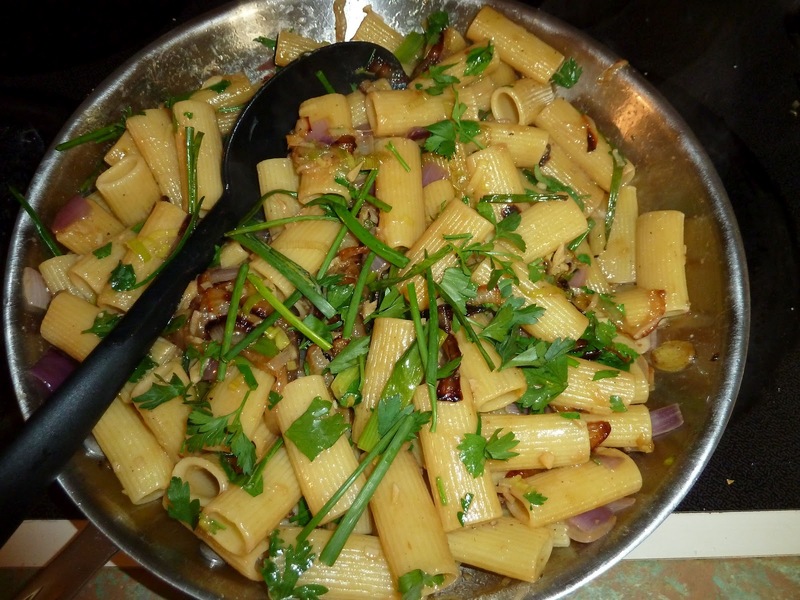 Either way, totally up my alley, caramelize the Vidalias, then sauté everything else and toss it with some big pasta. 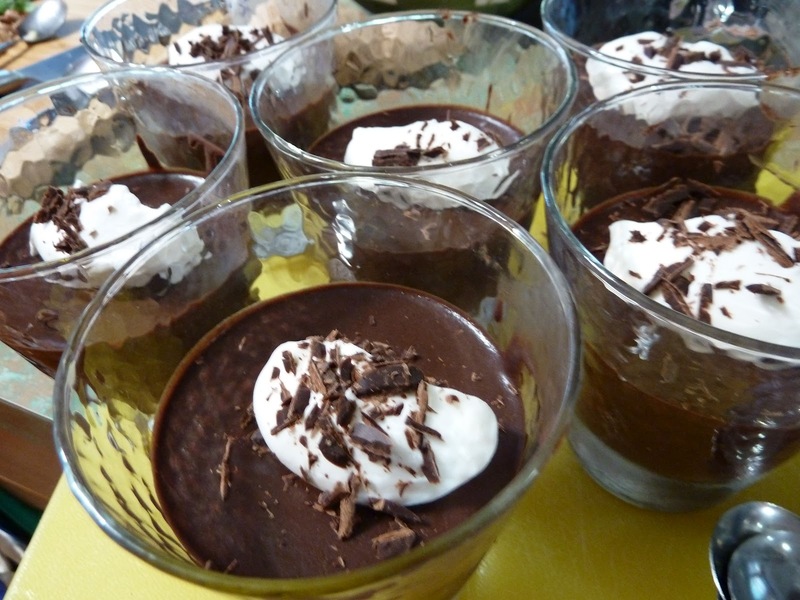 Easy one: This is basically a thick, rich … really thick, really rich … chocolate pudding, flavored with red wine. Bulletproof. I had a little bit of trouble finding valpolicella. Well, until I asked at Mazzaro's. Then I had to pick from one of the 4-5 kinds they had. I should really ask about stuff more often. One thing: The recipe says it serves 8-12. I made 9 servings, and no one … no one … was able to even eat half. And not because it wasn't delicious. It was probably the best pudding I've ever had. Just. Soooooo. Rich. Easy one: You just have to have good tomatoes. If you do, this will be awesome. If you don't, it can only be as good as the tomatoes. I got good tomatoes from a roadside stand. They were great. And I got bread at Mazzaro's. So that worked out, too. The cheese is cacio di roma, a semi-firm sheep's milk cheese. I haven't seen it around here, but I found it at Whole Foods while I was in Miami. I suspect if I looked hard enough around here, I could have found it, but it jumped out at me in Miami. Let this be a lesson to you: Always travel with a cooler. * Note: These were all made -- and written -- before I left Florida. So that explains some of the references.